I’ve always wondered why I never enjoyed celebrating my birthday. As a kid, I had no problem with it. It was more exciting for me than Christmas. Of course, as a child, you don’t think about the meaning of a birthday. To me, a birthday is a day to celebrate one’s being born, and their existence in this world. As I grew older, I realized each year I began to care less and less about celebrating my day of birth. I couldn’t understand it and I slowly accepted that on my birthday I just didn’t get excited. My friends would be so confident and able to act like royalty on their day, why couldn’t I? It all starts with my being adopted, pretty much right after birth. I’ve had trouble finding any positivity in celebrating the day that my mom had to give me up. It feels wrong to celebrate. My birthday reminds me of a loss. But the older I get, and the more I realize what’s behind my feelings, I can understand that it’s okay to be celebratory. For my birth mom, for myself, for my mom and dad that raised me. I don’t know why she couldn’t keep me, and for all I know she doesn’t think about me at all. But deep down I truly believe she thinks about me on my birthday. As hard as it is for me, I suspect it’s even harder her. All I can do is live happily and love who I am! Please take a moment to read my newly published article! My father and I worked on this piece over the summer. It’s a point of view article in response to another woman’s article that she published. Her article was about how she believes international adoption should be abolished or curbed, because she has a daughter that she internationally adopted. It’s a very interesting piece! Enjoy!! The July sun beamed down on his sticky, moist skin. His face shriveled as sweat dripped into his left eye and down his cheek. He wiped it away as another droplet of sweat cornered its way into the left side of his mouth, that familiar taste of soot. The three-story house in front of him was engulfed in flames. Fire spit out of the windows making the house look angry. His gear added an extra fifty pounds to his own weight, making it harder to maneuver. He knew he had to stay calm and concentrate. He grabbed an axe and held it in his left hand as his right hand guided him up the ladder. Just one more step…remember to breathe…keep your head up, you’re almost there. His mind was racing and he knew he had to act quickly. The other firefighters were readying the water supply. He reached the first window and smashed the glass with his axe. He entered the room and began his search. The fire roared and hissed like an out of control bonfire with small and large bangs every now and then. The smoke covered the entire room and entered his body making it hard for him to breathe. He grabbed his axe and whacked it into the wall. The only way he could conduct a safe search in such an environment was to make a place for his axe in a wall of the room. He grabbed hold onto his axe with one hand, while using his free hand to look for any sign of life. His mind flashed back and forth between the past and present day. He would never forget the day he let one slip away. Sam’s first fire as a firefighter was a year ago from this day in July. His company was called to a two-story house fire. He remembered his captain telling him they had a mother and her baby stuck in their bedroom on the second floor. He quickly positioned the ladder and grabbed his axe. When he entered the room, he banged his axe into the wall and began his search. The thoughts running through his head were thoughts he had never had before. Today, I’m going to die. This is it. I wish I had told my fiancé I loved her one last time. The negativity kept pouring in. The fire scorched the back of Sam’s neck where his helmet didn’t cover. Just find the woman and her child safely. Don’t worry about what happens to me. Find the mom and her baby. Sam’s hand was shaking as he felt around the room for life. He couldn’t see or breathe easily. The mask helped a little, but the smoke was too thick. He no longer knew what he had signed up for. Sam’s left hand kept banging into what might’ve been a dresser or a television stand. He then felt the mattress of a bed, and next to it he grabbed a hold of something squishy, and what felt closer to a human. Sam kept his hand on what he believed was the mother. Her arm was slender but tough. He could feel a slight pulse coming from her wrist. Sam had high hopes. He radioed in that he had someone and was coming down. As soon as he came down, the medical personnel immediately acted on the patient. Sam wanted to believe she would make it, but her body was covered in third-degree burns and her face was almost deformed. She never made it. Now, a year ago from today, Sam is fighting a three-story house fire. The smoke in the room is how he will always know it, heavy and black. He replays the scene from a year ago in his head. As he searches around the room, he remembers his captain telling him the baby was in the same room as the mother. It was my fault. What if it happens again today? Sam’s heart beats faster and faster as his breathing increases. The sound of his own breath increases his anxiety. His head is sweltering even though he has a helmet on. He hears someone screaming for help. Sam tries to head towards the noise while keeping concentration, as the water from the hose sprinkles onto his bare neck, burning him temporarily. “I’m in here! HELP ME, PLEASE!” The man screamed repeatedly. Sam found his way through a doorway. He accidently banged his head on a picture frame. The glass shattered and he knew it was the least of his worries. He felt around the room as the heat from the fire became more and more unbearable. He called out for the person to respond if he could. The man yelped again. It turned out he had his dog with him cradled in his nearly burnt arms. Sam grabbed the man and his dog and brought them to safety. Sam was at home when he received the phone call from a man named Daniel Carr. This was the man Sam had saved. He was in his mid-forties. He had suffered second-degree burns to his arms, face and legs. His dog had to be euthanized due to excessive heat and respiratory failure. Daniel was a recent widower. He called Sam to thank him for saving his life. He had mentioned to him that he lost his wife and child a year ago from today, in a house fire. Sam dropped the phone. His legs gave out and he dropped to his kitchen floor. The tiles were cold on his cheek. His lips trembled and tears began forming in his eyes. He had a burning sensation in his throat. Sam curled up bringing his legs to his arms and hugging them closely to his chest. He couldn’t believe it. The man he had saved was the husband of the woman and the father of the child he failed to save. Sam could hear Daniel on the other line calling out his name. He was stuck. His thoughts began to race and he felt weak. Sam reached out for the phone and began to tell Daniel his story. He apologized continuously while trying to hold back the tears. “You did all that you could’ve done. I miss my wife and daughter every day. I was at work that afternoon, and can’t help but think if only I were home, I could’ve saved them. Many things are out of our control, and this is merely an example of how tricky life can be. Please don’t fret. You saved my life, didn’t you?” Daniel chuckled, and then cleared his throat. Sam couldn’t help but cry. He cried to Daniel. He vented to a man he had only met once. After a few hours, Sam and Daniel ended their conversation. They promised to keep in touch and grab an ice-cold beer once Daniel fully recovered. Sam got up from his kitchen floor and walked over to his new leather recliner. He pushed in the black plastic button on the side of the recliner to be able to lounge out. He closed his eyes and tried to focus only on his breathing. In and out, in and out. Everything is going to be fine. The morning sun is her rooster. It creeps in through the window panes, fighting through condensation. Her eyes struggle to open. She’s comfortable waking up alone. Why does she need anybody when she has herself? She gazes at a single drop of water on the window. It sparkles from the sun beaming on its back. The word floats around wondering why it exists. Is she alone like the one drop of water that ended up alone? Or is she alone like the many people surrounded by people, that still seem to be alone? They can carry a meaning or carry nothing at all. August 20th has always been a significant day for me. I arrived from Seoul, South Korea to Providence, Rhode Island. 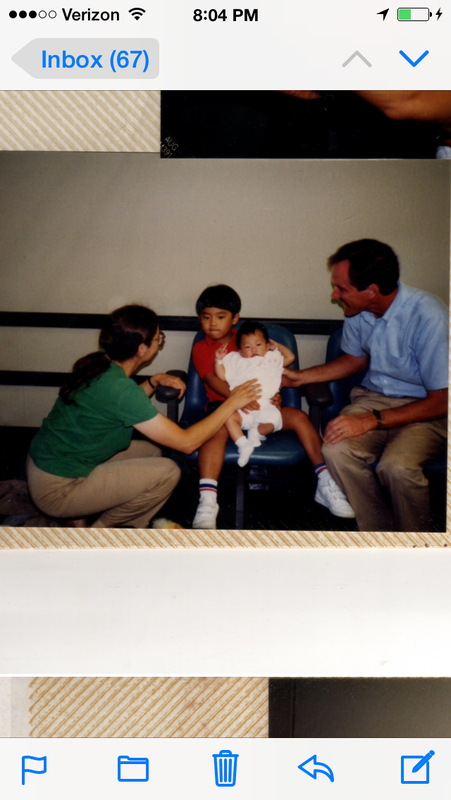 I was four months old and adopted by a Caucasian couple that had also adopted a baby boy from South Korea five years before. I would soon find out he was my brother, and the only brother I would know of. My adoptive parents made up a unique day for my brother and me. 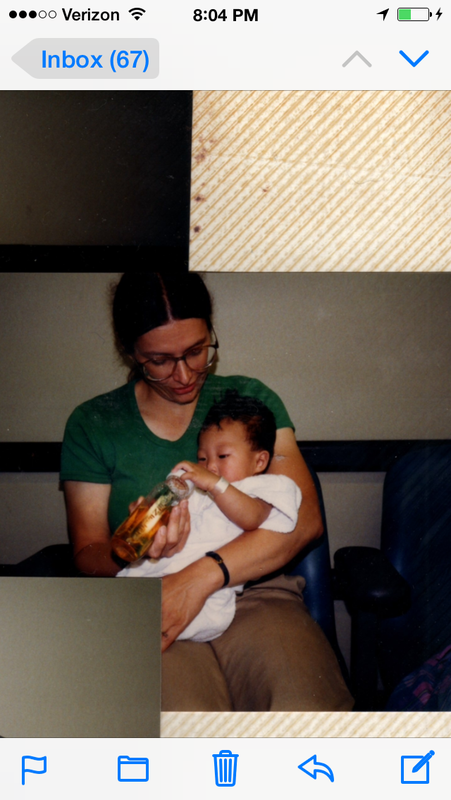 This day is called, “Arrival Day.” Both of us used to celebrate the day we arrived from South Korea. As a kid, I viewed my Arrival Day as a second birthday. I would receive gifts and was fed a special meal of my choice, as well as a cake at the end. It was an exciting day. I remember looking forward to it like my own birthday. My friends would ask what the day meant and I wouldn’t be able to explain, so I would have my parents tell them. As I became older I realized I never put my Arrival Day into perspective. The day shouldn’t be about gifts and special treatment because it’s a day to embrace the person I am. It is a day to think of how lucky and fortunate I am to have my family, who have always been there for me. My Arrival Day is an emotional day for me, but in a positive way. It opens up my eyes to the concept of life. Who knows what my life would have been like if my birth mom decided to keep me, or get rid of me. Life can be gone in the blink of an eye, and twenty-three years later, here I am. I’m alive and healthy, I have my family and friends, along with a supportive boyfriend. Never take anything for granted. Sure, gifts are nice and so are cakes, but the smaller things are what really matter. Being loved and supported is a divine feeling, it is the best feeling. Always put things in perspective. Remember how lucky you are. Remember, you’re alive. All you are doing is being untrue to yourself. Why do we become embarrassed? In my opinion embarrassment stems from many different emotions. I’ve seen so many different incidents in which embarrassment was an outcome. I’d like to explain a few of mine, and then explain why I believe others become embarrassed as well. As a child, I used to become embarrassed and timid because I would notice others staring at my parents and me because I don’t look anything like them. That embarrassment would become a part of my life as I grew up. It followed me and almost haunted me, and changed me as a person. I realize now that my becoming embarrassed because of others staring was because I wasn’t comfortable with being an adopted Asian-American. Growing up I very self-conscious and always was worried about how I looked to others. I felt that I needed to have blonde hair and blue eyes to fit in. I’ve definitely grown out of that and am proud to be an Asian-American with wonderful parents. I don’t become timid or embarrassed anymore when I’m with my family because I am proud to show the world what a unique family that I am a part of. Another story that comes to mind when thinking of embarrassment entails me tripping over my own feet. I’m a clumsy person and I can’t control it even if I tried. Whenever I trip and fall or run into anything I find it hilarious. I always laugh even if there is pain involved. That embarrassment then makes me laugh and enjoy how silly I can be. 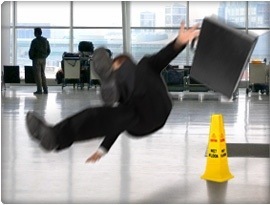 Sometimes when one falls or trips by accident, he/she then becomes angry, shy, or flustered. Those emotions then explain that person and how he/she handles him/her self. I tend to think that when one trips and falls and becomes angry, it’s obviously because they’re embarrassed, but it’s also a sign that maybe he/she shouldn’t be so hard on him/her self.